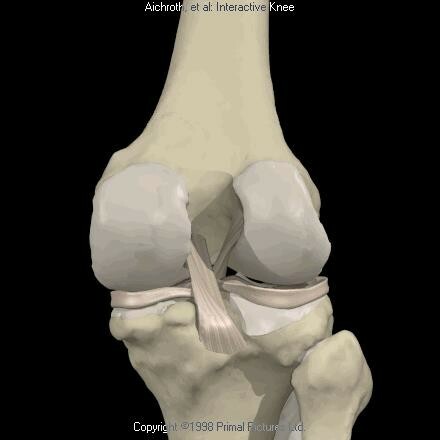 The anterior and posterior cruciate ligaments are found in the middle of the knee and cross over each other. One at the front of the knee. The other at the back. Hence the name: anterior cruciate ligament (ACL). They provide the knee with forwards and backwards stability. The anterior cruciate ligament also plays a major role in rotation stability and in protecting the menisci. A torn anterior cruciate ligament usually occurs following sudden rotating manoeuvres with the knee straightened, as well as pivoting movements or torsions when exercising. When playing football this is frequently the result of what is called the ‘cutting’ manoeuvre. It involves the player performing a rotating movement across his/her supporting leg to suddenly change direction. These types of twisting movements are also performed in other sports. Complaints related to this movement involving the anterior cruciate ligament are very severe and can lead to a torn cruciate ligament. If this happens, without coming into contact with your counter player, your knee will give way causing a great deal of pain. The patient often reports hearing or feeling a ‘crack’ when it happens. He or she is unable to carry on playing. The knee will gradually swell up as the result of bleeding in the knee and will feel unstable. However, in some cases the complaints are far subtler, with just mild swelling and pain. The diagnosis related to the anterior cruciate ligament is made on the basis of the patient’s account and the clinical examination. In addition, the doctor will conduct a series of tests to examine the stability in the front-backwards direction and the rotation stability of the knee. An MRI scan is recommended in most cases to confirm the diagnosis and detect any additional injuries to the cartilage, meniscus and collateral ligaments. Often part of the capsule around the knee is also affected. This capsule contains the new knee ligament, the ALL (anterolateral ligament) that was recently discovered. The anterior cruciate ligament does not have great potential to heal, which means these injuries do not heal by themselves. Treatment will depend on the patient’s age, individual needs and degree of the knee’s instability. Non-surgical. Surgery can be avoided in older patients that do not present any instability complaints. Physiotherapy will be prescribed to strengthen the stabilising muscles around the knee. In most cases sport involving rotating movements will have to be avoided. Surgical. In most patients the decision to surgically reconstruct the cruciate ligament will be based on instability complaints, age, level of activity and additional meniscus or cartilage injuries. Stiffness of the knee is mainly taken into account with regard to the timing of the reconstruction (as it must be avoided). Therefore the operation can usually be performed within six weeks after the trauma. Ideally, the procedure should be carried out before 9 months, since afterwards often additional stretching of other ligaments occurs and the risk of additional tears in the meniscus increases significantly. An anterior cruciate ligament reconstruction is a common operation. A cruciate ligament that functions properly is vital in contact sports, to provide the knee with adequate stability. 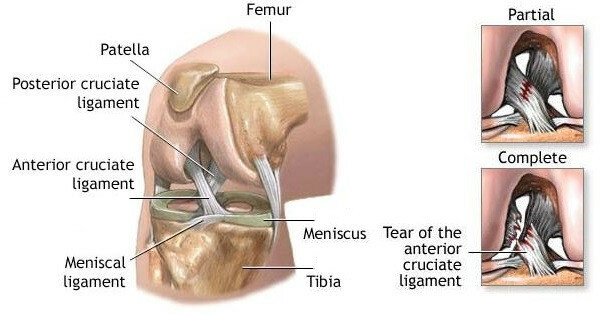 However, the cruciate ligament also plays an important role in protecting the meniscus, especially when we are young. Too much slack on the knee can cause meniscus tears and osteoarthritis in the long term. One or two of the patient’s hamstring tendons are usually used to reconstruct the cruciate ligament. They are removed via a small incision and transformed into a new cruciate ligament. The new cruciate ligament is secured to the bone on top and under the knee via keyhole surgery. It is important that it is attached at the exact position of the original cruciate ligament (= anatomical anterior cruciate ligament reconstruction). If this does not happen, stability cannot be fully restored. The major advantage of using your own tendons (=autograft) is that they are considerably stronger and fuse better than donor or artificial tendons. Everyone has four hamstring tendons on the inside of the knee and can do without one or two without experiencing any adverse effects. The disadvantage of using our own tendons is that they need time to fuse. It usually takes six months before the ingrowth is strong enough for the patient to resume sporting activities. 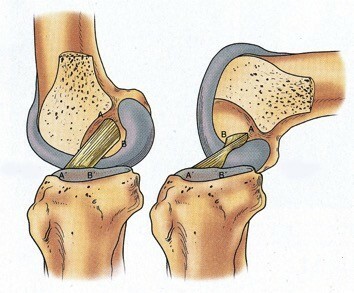 In selected cases, the ALL (anterolateral ligament) will also be reconstructed. This may be vital, especially in sports involving pivoting (football, basketball etc. ), in order to improve rotation stability of the knee. Besides traditional anterior cruciate ligament reconstruction new techniques are also being developed in which the anterior cruciate ligament is repaired instead of reconstructed. The great advantage of this is that the patient’s tendons do not have to be used to repair the cruciate ligament and thus proprioception. These techniques are still in the research phase but initial results are promising. Discuss them with your doctor if you have any further questions. The operation is performed in the outpatient clinic or with brief hospitalisation (one night). The patient will have to use crutches for around three weeks, and start to put weight on the knee gradually. A specific physiotherapy programme will be provided after the operation. The physiotherapist will guide the patient. During the recovery period it is very important to retain muscle control and muscle mass. Around five months later a special test will be conducted (biodex), which examines whether the patient is ready to resume sport-specific training. If the reconstructed anterior cruciate ligament tears again, we call it a relapse. In the first instance the doctor will examine the cause of the relapse. 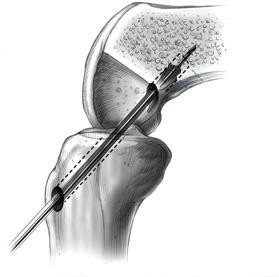 In many cases a new procedure is necessary to repair it: revision anterior cruciate ligament reconstruction. This is more complex surgery that must take many different aspects into account. It is mainly the position of the former bony tunnels that will determine whether the procedure can be performed in one or two operations. Since the patient’s hamstrings are usually no longer available, part of the patient’s quadriceps, own patellar tendons, donor or artificial tendons will be selected. This will be decided in consultation with you. In addition, ALL reconstruction will also be necessary in most cases. The posterior cruciate ligament is considerably stronger than the anterior cruciate ligament. Consequently, posterior cruciate ligament injuries are not as frequent and are usually the result of very severe trauma (heavy tackle, traffic accident, etc.). The symptoms are relatively similar to a tear in the anterior cruciate ligament. An MRI scan is recommended in most cases to confirm the diagnosis and detect any additional injuries to the cartilage, meniscus and collateral ligaments. The injuries are classified in varying degrees depending on their severity. In a low grade or minor injury the stability of the knee is largely preserved. These injuries do not usually need any surgical treatment. Physiotherapy focusing on strengthening the quadriceps offers relief in this case. There is more to a high grade or serious injury. Very often, other important structures are affected (lateral band, posterolateral corner) with pronounced laxity of the knee. Surgical repair is generally required.